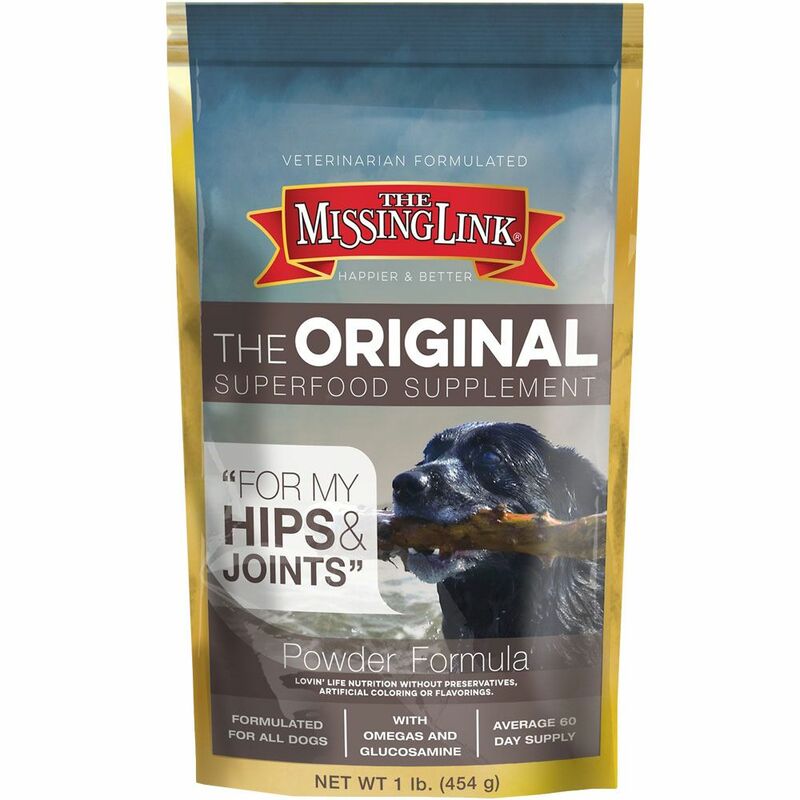 Missing Link The Original Hip & Joint All-in-one Superfood with added Glucosamine - The Missing Link targets the nutritional gap between what nature provides and what's available in commercial foods. Missing Link is formulated with the highest quality Glucosamine, and its synergy with naturally occuring essential fatty acids and flax lignans proves the ultimate in joint support. Our proprietary, patented cold-processing method ensures the freshest delivery of precious omega-3 fatty acids in bombination with a broad spectrum of natural fiber, and phyto nutrients. HEALTHY JOINTS Add a spponful to your dog's food to help promote healthy joints, flexibility, and sustained energy levels. POWERFUL POWDER This powerful, powdered superfood supplement is chock full of joint and bone health supporting glucosamine and balanced Omega 3 and 6 fatty acids, as well as dietary fiber and phytonutrients to support your pet's digestive system and overall health and happiness. SUPERFOOD NUTRITION This superfood supplement packs the vital nutrients your dog's kibble is likely missing through sourcing and/or the cooking process. Superfoods are nutrient-dense foods that naturally contain high levels of vitamins, minerals, fobers, and antioxidants that help bridge the nutritional gap in your dog's commercial food. ADDITIONAL BENEFITS In a addition to promoting healthy joints, this superfood supplement also contributes to a healthy digestive system and the health and appearance of the skin and coat. FEEDING INSTRUCTIONS Depending on your dog's weight, add the suggested amount to your dog's food as a supplement. For optimal effextiveness, we suggest adding the Missing Link® daily. This product is formulated for all dogs. Fur kiddo not getting around like he or she used to? 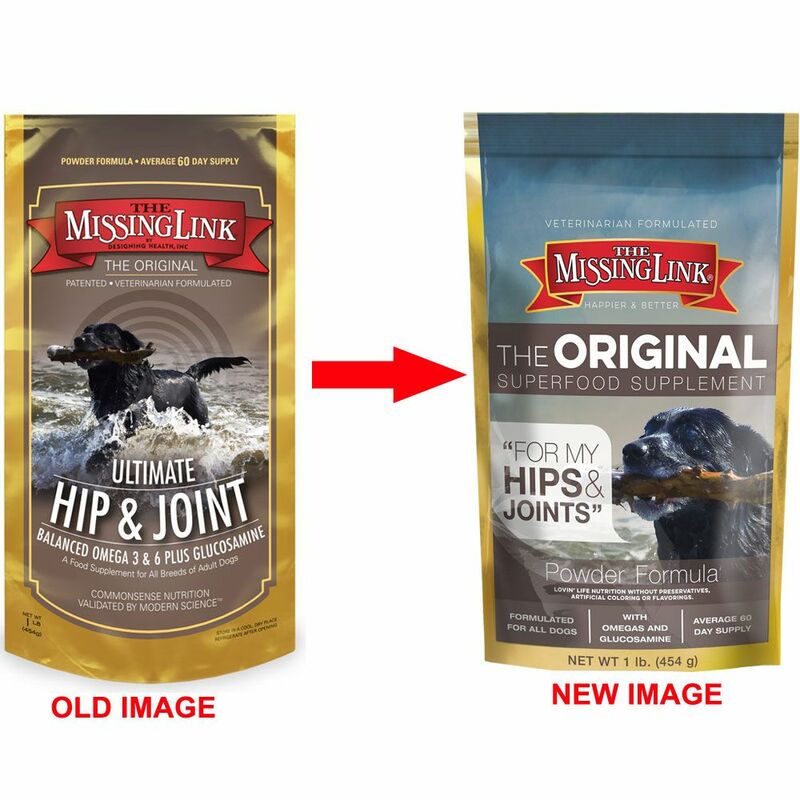 Add a daily helping of the Missing Link Original Superfood Hip & Joint formula to your pet's food. This powerful, powdered superfood supplement is chock full of joint and bone health supporting glucosamine and balanced Omega 3 and 6 fatty acids, as well as dietary fiber and phytonutrients to support your pet's digestive system and overall health and happiness. Add a spoonful to your fur kid's bowl and get ready to run ... or at least go for a really long walk. Glucosamine to support health joints and flexibility. Omega fatty acids to support intecellular health, for absorption of fat soluble vitamins, and to maintain energy levels. Dieatary fiber to promote a healthy digestive system. Phyto (plant) nutrients to supoort general health and nutrition. INGREDIENTS: Ground Flaxseed, Glucosamine Hydrochloride, Freeze Dried Beef Liver, Cane Molasses, Rice Bran, Primary Dried Yeast, Sunflower Seed, Dehydrated Alfalfa Meal, Dried Carrot, Ground Beef Bone, Dried Fish Solubles, Freeze Dried Oyster, Ground Barley Grass, Dried Kelp, Zinc Methionine Complex, Lecithin, Selenium Yeast, Pyridoxine Hydrochloride (Vitamin B6), Niacin (Vitamin B3), Garlic, Taurine, Yucca Schidigera Extract, Riboflavin (Vitamin B2), Thiamine Hydrochloride (Vitamin B1), Folic Acid and Vitamin B12 Supplement. Add the Missing Link® to your dog's diet according to its weight. Due to the high fiber content, start with small amounts and gradually increase to the recommended level over the course of a week or two. This is the best missing link you can find for a good price. ProsThis is the best ever for our dog. I started giving this to my older dog one year ago. A friend mentioned it, after they saw the skin issues she had. At the time, I didn't realize that there was a formula just for skin. Apparently they have some of the same ingredients. She is a little more active than she was, and her fur is thick and lovely. Better than I've ever seen it in all of her life. I used to buy it at PedMeds, but I found it to be less expensive through Healthy Pets, even with shipping. Although I do think the shipping charge is a little high, considering it's shipped in a USPS envelope...and you don't even get a dog biscuit. :-) But still less expensive overall. I started my 11 year old Pug on this product about 2 months ago and she is almost acting like a youngster again. Her black coat is more shiny than it has been since she was young and she has a lot more energy. I fully reommend this wonderful product and will continue using it. I saw the percentage of glucosamine but that doesn't tell me how much my dog gets in each portion, which is what I'm trying to find out. Caryl, Great question, after some calculations each tablespoon is approximately 400 mg of Glucosamine. Great question Caryl, After some calculations, each tablespoon contains approximately 400 mg of glucosamine. (Each Tbsp. is 8 grams) x 5% = .400.